One of the big complaints with rare syndromes is that there aren’t enough clinical studies to address our needs. PROMPT is a study that combines data from not just families with LFS, but from many different mutations that are linked to cancer. This is significant to our community because by finding likenesses and differences between different mutations, we can better understand our risk which can help us plan specialized screening. If you had a genetic test that was positive for a germline TP53 mutation- you can enroll! 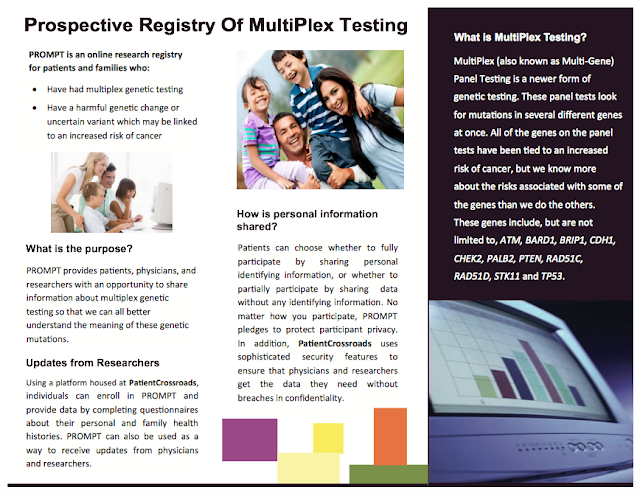 PROMPT stands for Prospective Registry Of MultiPlex Testing. The first step is to follow this link, enroll and fill out a brief questionnaire. Your information will be kept private, but information about you can really help researchers understand mutations and risk better. How many times have you heard, if I had only known? This is helping researchers gather enough data so they can help doctors inform patients of risk by comparing the medical histories of others. You will be asked to register for the study and fill out questionnaires about your personal and family health history. Ann Ramer talked with Dr. Robson on one of her visits to Memorial Sloan Kettering Cancer Center and shares a lot of good information about why this such an important study for our community. This is a great blog post for more information. Check out this video of Dr. Robson and Dr. Domchek talking about the study, how to participate and what is required. PROMPT final 08.22.2014 from PatientCrossroads on Vimeo. The researchers at PROMPT are wonderful and happy to anwer any questions or address any concerns.